Mary and Henry Epp, 1970. Family photo. Henry H. Epp: minister, visionary and conference administrator; born 23 March 1925 in Winkler, Manitoba, Canada to Heinrich M. Epp and Anna (Enns) Epp, as oldest child of 13 and the first son. He married Mary Reimer (31 March 1928-11 April 2010), daughter of Johann and Elizabeth (Fast) Reimer, on 26 August 1950 in the Waterloo-Kitchener United Mennonite Church. They had seven children–twin girls died prematurely. Henry Epp died at the Vineland United Mennonite Home on 28 January 2010. He was baptized in the Lena Mennonite Church in 1942. His elementary education was in the one room school called Plum Hollow, near Lena, Manitoba, and he completed his high school education at Mennonite Collegiate Institute (MCI) in Gretna, Manitoba. Henry H. Epp completed a BA at the University of Western Ontario (1951) and a MDiv. from Bethany Theological Seminary, Chicago, Illinois (1958). He also took courses through Gonzaga University in Spokane, Washington (1978-1979). As a conscientious objector to war in 1944, Henry Epp worked as a ward attendant at the Brandon Mental Hospital for an 18-month term, before enrolling at Bethel College in North Newton, Kansas in 1946. In 1948 he went to the Waterloo-Kitchener United Mennonite Church (WKUM) in Ontario-–first as assistant minister to Jacob H. Janzen, and then as leading minister. He was ordained in this church in October 1948. 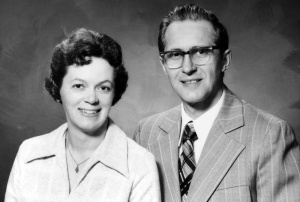 Henry and Mary went to South America in 1953 at the request of the General Conference of North America Mission Board. He ministered to a Mennonite congregation in Asunción, Paraguay, and taught at the Mennonite Biblical Seminary in Montevideo, Uruguay. He returned to the WKUM Church in 1958 and ministered there until 1965. The family moved to Winnipeg, Manitoba in 1966, where he was Executive Secretary of the Education and Publication Board for the Conference of Mennonites in Canada (CMC) until 1974. Here he wrote Christian educational material, articles for Mennonite periodicals and also functioned as the archivist for CMC. During this time he was a charter member of the Fort Garry Mennonite Fellowship helping to write their covenant in 1967. In 1974 he accepted the position as lead minister in the Vineland United Mennonite Church in Ontario. In 1978 a move was made to British Columbia, where he was involved in the ministry of the Yarrow United Mennonite Church (1979-1982) and the Kelowna First Mennonite Church (1983-1986). Henry H. Epp was a founding member of Conrad Grebel University College and served on its first board. In the early 1950s he served as vice chairman for the Conference of Historic Peace Churches. He served as the first chairman of Mennonite Central Committee Ontario in 1965. He was also a board member of MCI in Gretna. In his later years Henry Epp created a policy manual for the Kelowna Board of Education and researched and developed a government-funded Seniors' Outreach Program under the umbrella of the Salvation Army. In his retirement he began to write his memoirs, A Place on Planet Earth, which he never completed due to Alzheimer’s disease. Music was very important to him, he had a great voice and loved to sing, first along side his mother, with his siblings and then his own family. He and Mary started several hand-bell choirs. Henry H. Epp chaired the commission which produced the Gesangbuch der Mennoniten (1965) and Handbuch zum Gesangbuch der Mennoniten (1966). With the support of his wife Mary, Henry was actively involved in ministry, committee work, writing, and furthering the vision of the Mennonite church. Kaethler, Esther and Mary Eleanor Penner. Interviews by author. Vineland, Ontario. (25 November 2012, 12 January 2013). Petkau, Evelyn Rempel. "From Manitoba to Paraguay, a minister to the world." Canadian Mennonite 14, no. 4 (22 February 2010): 26. Sawatzky, Linda Epp. Side by side: a memoir of parents, Anna Enns and Heinrich M. Epp. Winnipeg: Eppisode Pub., 2010. Mennonite Heritage Centre archives (Winnipeg, Manitoba): Henry H. Epp fonds. Klassen, Maria H. "Epp, Henry H. (1925-2010)." Global Anabaptist Mennonite Encyclopedia Online. February 2013. Web. 18 Apr 2019. http://gameo.org/index.php?title=Epp,_Henry_H._(1925-2010)&oldid=142152. Klassen, Maria H. (February 2013). Epp, Henry H. (1925-2010). Global Anabaptist Mennonite Encyclopedia Online. Retrieved 18 April 2019, from http://gameo.org/index.php?title=Epp,_Henry_H._(1925-2010)&oldid=142152.